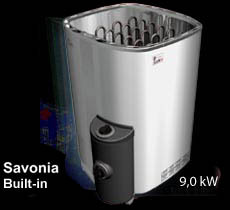 The Savonia Built-in Control heater has temperature and heating time controls mounted on its body and thus the heater can be used in many different kinds of sauna rooms. Control unit has signal lights, which show the operation of the thermostat and the timer. All metal parts of the heater, like the adjustable legs, are stainless steel. Savonia Built-in Control can heat aroud 50 kg of stones.Available at 9,kW.